This Passport is your gateway to twelve spectacular shipwrecks in the Gulf of Mexico. You may start your journey along the trail at any of the twelve desinations; upon completion of each dive be sure to have your Passport validated with a signature and sticker. Note that the Passport has a QR Code that allows you to access this webpage by a smartphone using a QR code reader. 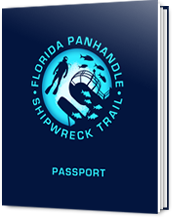 Trail passports are available from participating dive shops and charter boats. Download media information, images, partner listings and videos for the Florida Panhandle Shipwreck Trail.